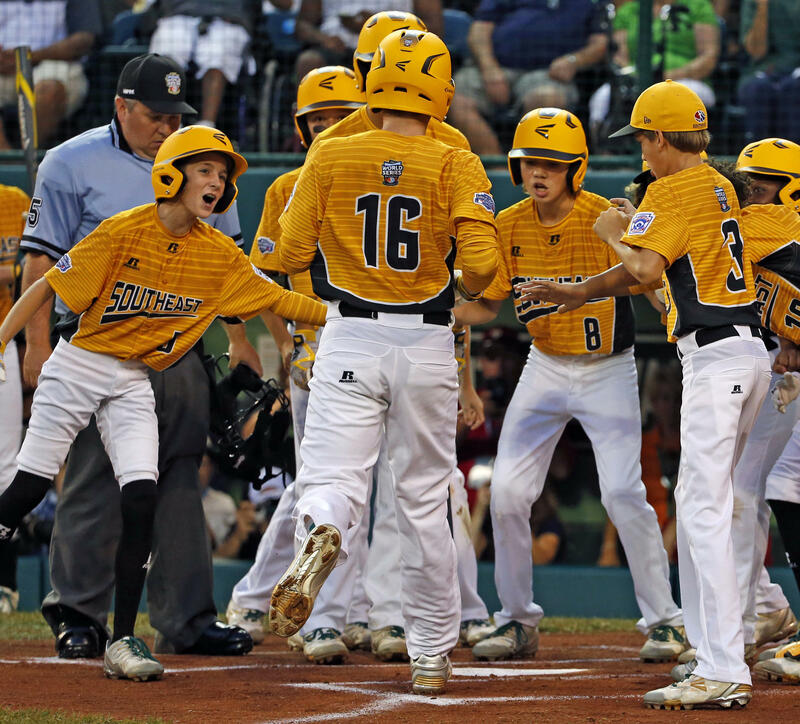 Greenville, N.C.'s Carson Hardee (16) is greeted by teammates after hitting a solo home run off Lufkin, Texas, pitcher Hunter Ditsworth during the first inning of a Little League World Series baseball game in South Williamsport, Pa., Wednesday, Aug. 23, 2017. North Carolina won in seven innings, 2-1. Connecticut's Ethan Righter shut down a New Jersey team on opening day that averaged 10.8 runs per game in regional play, the best mark of any American team heading into the tournament. Greenville was so efficient from the mound in its no hitters that it was able to stay mostly under Little League's pitch-count restrictions that require up to four days of rest, depending on the number of balls a pitcher throws. On Wednesday night, Matthijs struck out 12 in 4 1-3 innings in Greenville's 2-1, seven-inning victory over Lufkin, Texas. "They throw strikes. They work the strike zone. They change speeds," Greenville manager Brian Fields said after the second no-hitter. "They get ahead of hitters and that's what you need to do in Little League." Easier said than done for 12- and 13-year-olds, especially when they're facing the best young hitters in the world. Most hitters in the Little League World Series can catch up to a 70-plus-mph heater thrown over the middle of the plate — they wouldn't have made it this far if they couldn't. That makes pitch location and breaking balls that much more important. "It's very difficult for even quality players to get the bat around, particularly if they've got good off-speed pitches," Canada coach Ryan Hefflick said. Righter's fastball in the opening game against New Jersey, for instance, was clocked consistently around 68 mph, a velocity that most hitters can barrel up. What makes that fastball so effective, however, is his knee-buckling curveball that crosses the plate about 10 mph slower. Batters have to think about prolonging their swings enough to connect with the curve. Factor in the tailing bite to Righter's breaking ball, and now hitters are reacting to where they think they pitch will be when it's time to swing. All this happens in less than a second. "He was dynamic," New Jersey manager Robert Grano said about Righter. "He could place his fastball anywhere he wanted. Great curveball. One of the best fastballs we've seen." This is the second trip to the Little League World Series for Grosse Pointe, Michigan, manager Jason Hill. He was also here four years ago when his eldest son's team qualified for the tournament. "The pitching is even better," said Hill last week. "Some of the pitching I've watched across the regions is better than I've seen in a lot of years."